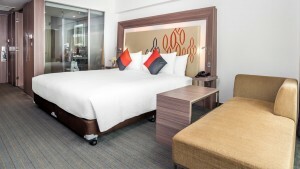 Located on Silom Road, Novotel Bangkok Fenix Silom Hotel is the perfect base for your Bangkok trip. This Silom hotel can be reached by the 2 nearest BTS skytrain stations; Surasak and Saphan Taksin. Moreover, Sathorn Pier is set within a short walk from the hotel. This provides a great way to get around Bangkok’s old town area by boat. For convenient car travel, the hotel is next to the Sirat Expressway which offers an easy commute to the different parts of the city. Thanks to a prime location, staying in this hotel on Silom Road will fulfill your travel needs in many ways. Business travelers can reach the surrounding offices, embassies and financial companies easily, while leisure travelers can simply visit many tourist attractions on Silom or Charoen Krung roads and along the Chao Phraya River. For those who love to eat, they can try different types of food at the nearby street food stalls, local markets and modern restaurants. Night markets and entertainment centers are also within an easy reach of the hotel. After a busy day of exploring the town, you can rest assured that our staff will do their best to ensure your comfortable stay with us. Our 216 guest rooms and suites feature practical comfort and contemporary design. All units come with comfortable bedding and free WiFi internet. They also feature beautiful Bangkok’s city view. Other room amenities include tea and coffee making facilities and a mini-bar. Looking for a place to arrange meetings in Silom? Talk to our experts and arrange your event with us at the 2 meeting rooms. Their sizes are perfect for small meetings, fun workshops and seminars. Our team is ready to help you design meeting packages, arrange food options and provide technical support. In addition, the Web Corner with Apple computers is available for you to stay connected while traveling. Traveling with kids? We put you at ease as we allow up to 2 kids aged below 16 to stay with parents for free when using an existing bed. Besides, we offer free breakfast for your little ones to enjoy. Also, you can bring them to the Kid’s corner to enjoy toys, games and fun activities. It is located on the lobby level. 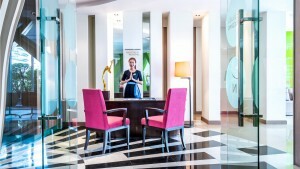 For sport and recreation, our hotel in Silom offers a lot of wellness facilities and services to keep you fit. Head to the In-Balance fitness center on the level 7 for work out and sauna rooms. Also, you can relax at the outdoor swimming pool or indulge in a range of relaxing massages at the spa. The SQUARE restaurant is an all-day dining place on the 6th floor of the hotel. It offers best value lunch and dinner buffet promotions suitable for all types of dining. Thus, make sure to come and enjoy our international dishes and seafood your way! Whether you want to dine in with family, colleagues or a group of friends, The SQUARE restaurant suits all your needs and occasions. Moreover, you can visit the STONE Bar for tasty drinks, light meals and live music. It is located right next to the hotel lobby. For those who like a private dining, the room service is available 24 hours every day. Simply order your favourite Thai, Asian or European dish with us then enjoy it in your own room! Want to chill out a little longer till late? Walk down to the basement level of the hotel and you will find the famous Maggie Choo’s! We are sure you will love live music, DJ tunes and stage shows here. The club is open every night from 6.00 p.m. till 3.00 a.m. Whether you are on business trip or holiday, alone or with family; Novotel Bangkok Fenix Silom Hotel is a great choice for everyone!